The 20th annual Rendez-vous French Film Festival provides an opportunity for the British Columbia community to enjoy a rare slice of the award-winning global Francophone film industry. This is an event not to be missed. From February 7-16th 2014, Visions Ouest Productions will screen approximately 50 short, medium and feature-length films at various venues, including fiction, documentaries, and a special program to mark Black History Month. All films are presented in their original language with English subtitles unless otherwise indicated. 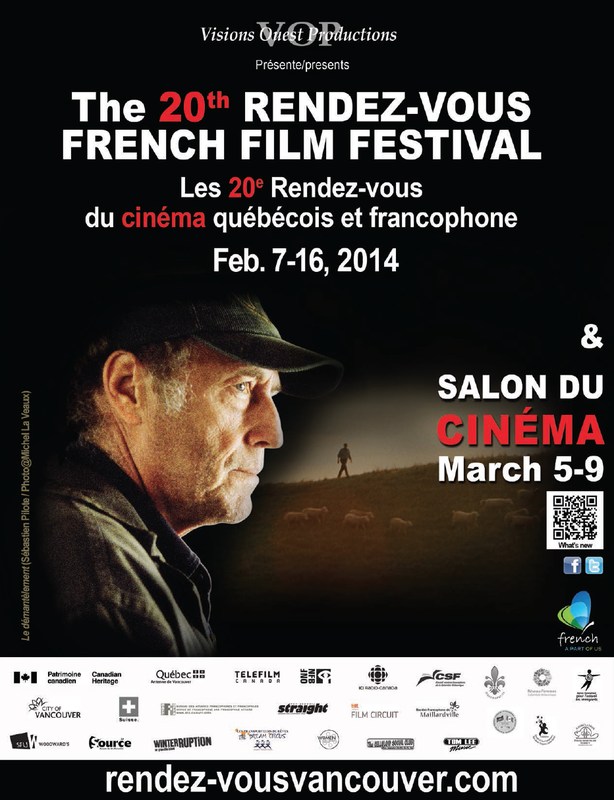 Visit the Rendez-vous French Film Festival website for programme information and to purchase tickets online. Tickets are also available at the door, 30 minutes prior to the first screening each day. Visions Ouest Productions (VOP) is a non-profit organization. The vision: To provide the French-speaking and the Francophile communities of British Columbia with artistic, cultural and educative programs and services recognized for their quality and their innovative aspect and to contribute to the blooming of the Francophone community. The mission: VOP is committed to offer artistic, cultural and educative programs and services that help to create a strong cultural identity for the Francophone and Francophile British Columbians. VOP is also committed to participate actively in the development of the French-Speaking community. Previous Previous post: Registration for BC Family French Camp 2014 – now open! Make sure your CPF membership is up-to-date!